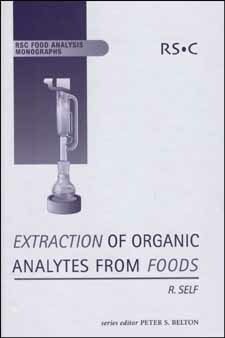 Extraction of Organic Analytes from Foods is a laboratory manual of methods used for the preparation and extraction of organic chemical compounds from food sources. It offers ideas on how to facilitate progress towards the total automation of the assay, as well as proposing assays for unknowns by comparison with known methods. Beginning with an introduction to extraction methodology, Extraction of Organic Analytes from Foods then progresses through sample preparation, extraction techniques (partition, solvation, distillation, adsorption and diffusion) and applications. Subject indices for the applications are organized by commodity, method, chemical class and analyte, and provide useful examples of references from the literature to illustrate historical development of the techniques. Extraction of Organic Analytes from Foods contains examples of methods that have been compared, combined or used in collaborative trials. They have been correlated and used to form the beginnings of a database that can be expanded and updated to provide a laboratory reference source.